Well, I’m still not 100% certain on the direction I’ll be taking for my dining room. I’m actually still reading comments from my last post. There’s some really good ideas in those comments, so I want to read through all of them and then mull over my options a bit. But there are three problems with those chairs. First, I started removing the leather (pleather 😀 ) from one of the chairs, and it’s taking FOREVER. There are so many nails, so many nailheads, and so many heavy duty staples holding all of that together, and it took me at least an hour just to get part of one arm and one wing uncovered. I mean, this stuff was NEVER meant to come off. So I can’t even imagine how long it’ll take me to remove everything from two chairs. Second, these chairs are really quite heavy, and I’m thinking that they’re way too heavy to be used as dining chairs that will be constantly moved in and out from the table. And third, much of this chair would need to be rebuilt. I don’t like the curvy, rolled arms, so I would want those streamlined. But the major issue is the legs. Not only are they not tall enough, but those front two Queen Anne legs stick out too far to allow for a skirt to hang straight down. That means that the legs would either need to be completely replaced, which is pretty major “surgery” on a chair, or the front of the chair right above the legs would need to be built out a bit more, which would probably make the chair seat too deep to be used as a dining chair. With that possibility looking like way more trouble than it’s worth, I’m now considering building my own host chairs. 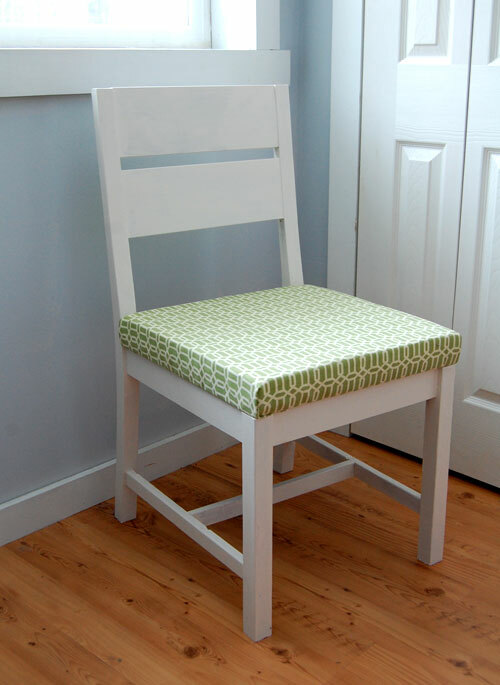 I’ve repaired and upholstered enough chairs in my life to know that the actual frames on chairs are really pretty simple in structure, and I just think making a chair from scratch to the exact specification that I need, and then upholstering that frame, will be so much easier (and probably take way less time) than searching for the perfect chairs to reupholster. So I’ve been searching for just the right inspiration — something with a streamlined design that would be relatively easy to build and upholster. I think that rules out anything with a curved back. I really like how streamlined the sides are, and how the wing and the arm are all one continuous piece. Of course, that chair has the legs showing, and I really envision my chairs being fully upholstered with no legs showing. The sides have that same streamlined design as the first chair, but the sides are cut so low that the chair really has no arms. I really like the look of that design, and I like that the armless design makes the chair seem less bulky. The curve at the top of the chair is nice, also. I like that camel back used with the side chairs that have straight backs, just like mine do. And then I’ve had this picture in my “dining inspiration” file for quite some time. Again, I like the streamlined design, and although these are slipcovered chairs, they are more representative of what a fully upholstered chair would look like at a dining table. I don’t plan on having slipcovers, though. Mine will be upholstered. But I do really like that band of solid fabric around the bottom. So that’s the plan as of now, and I’ll stick with it unless I happen upon two matching, perfectly shaped, perfectly sized, fully upholstered dining chairs that I can just reupholster. I probably shouldn’t count on that happening. 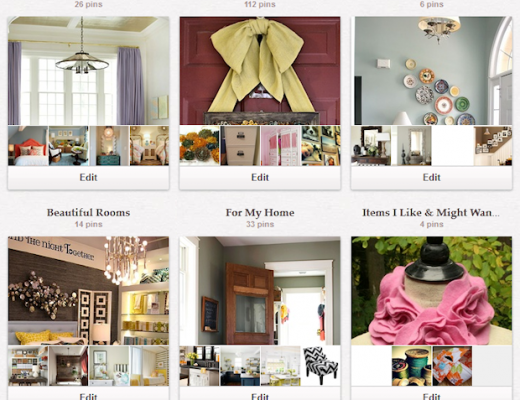 Question: How Do YOU Use Pinterest? So excited to see your personalized, modified chair design. Love that band on the bottom, too! I like the camel back chairs, and I also like the band of fabric at the bottom of the slip-covered chairs. That could be a great way to bring the coral color throughout the room, in the buffet, drapes, and again in the bottom band on the host chairs. I love everything you’ve done so far. I agree that these would look great in your room. I know you want to upholster the chairs but from a practical viewpoint, slip covers are easy to remove and wash.
All of the upholstered chairs are beautiful (I particularly like the armless design), but I do wonder about the functionality of these types of chairs at dining tables. Once seated, I think it would be difficult to slide myself and the chair close enough to the table to eat comfortably. I wonder if the fully upholstered ones by the round table are swivel chairs; that would make them easier to use. Why not put small casters on the end chairs? In theory, the chairs upholstered to the floor, sound nice, and are usually quite pretty. But have you ever actually tried to sit and eat at a table using one? I have found them to be quite a bother trying to slide in and out when you can not get hold of the seat. My own opinion, of course. Do you think the simpler cane back chairs will look all right with the fancier upholstered chairs? I’m not envisioning them together very well. But, not my house. Every time I think, what?!? it turns out to look quite nice. Oh, Wow!! This one is going to be LOTS of fun for me to watch and learn!! SO much fun to play!! My dining room chairs have cloth-covered seats, i.e., fabric stapled on plywood with a little padding. One seat ended up with a greasy stain and I had to undo dozens of staples to remove the fabric for washing. What I’m trying to say is that too much padding and upholstery can be a liability in a dining room chair. A living room chair should not be a dining room chair, IMHO, despite what is shown in decorating magazines. I’ve seen great-looking slipcovered dining room chairs that I think would be a better choice. If something gets on the slipcover, you take it off and wash it or have it cleaned. Plus, the slipcover gives the chair a formal look without the weight and problems of upholstery. Wow. 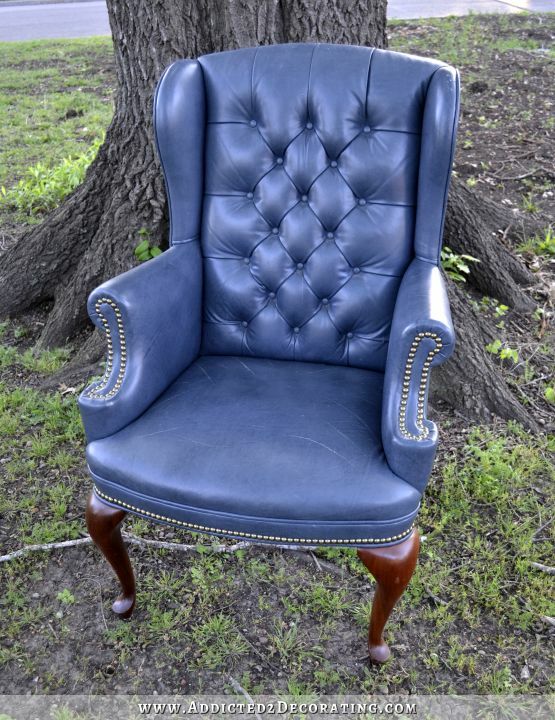 The rehab on those blue – grey “pleather” chairs sounds like more trouble than it’s worth. I like the chairs in picture no. 2 – Traditional Dining Room by North Palm Beach. I really like the way they make use of two contrasting fabrics with two different colors (upholstery and curtains) but it all pulls together nicely. How’s everything going so far with table and chair rehab? It’s not going well. 🙂 So far, I’ve repainted my chairs black, tried three different fabrics for the seats, and I still don’t like them. I think I just need to step away from the dining room completely for a few days. I’m sorry! Well, you are probably right – you just need a few days away from that project and I’m sure you will figure something out. Maybe there will be a nice surprise for your fans on your blog on Monday. Wait! No more green chairs?! Did I miss something? Early in your blog you wrote about rooms with 21 different colors and refining from there…I think a little of that may be going on right now. You have this beautiful room going on with all the detail but nothing really wanting to be neutral. What is it in this room do you want to make the statement…the chairs, the table, the curtains? I think once you determine the main player the rest will fall in place and like always you will have this beautiful room that we will all adore. Ps.Love the chairs Shannon linked to her comment, they have a style similar to what you were thinking, play well with your current chairs and would overpower the room, I think they may even look cool skirted. It will be beautiful! I love the cover with the ban around the bottom, but prefer the armless chair. I think armchairs can be cumbersome unless you have a large space! As usual, i love your taste! Kristi, you don’t like the striped fabric on your black chairs? That’s a huge, huge job you are taking on. Upholstering AND repairing? Those chairs (which are by the way gorgeous) are going to give you a hard time. I know, I know, I’m repeating what probably countless others have said about other projects you have undertaken, but…YOU ARE AMAZING. What? “Oh, I’m just going to build my own chairs. It won’t be nearly as hard as pulling staples and nail heads out.” You are my hero. I want to be you in my next life. 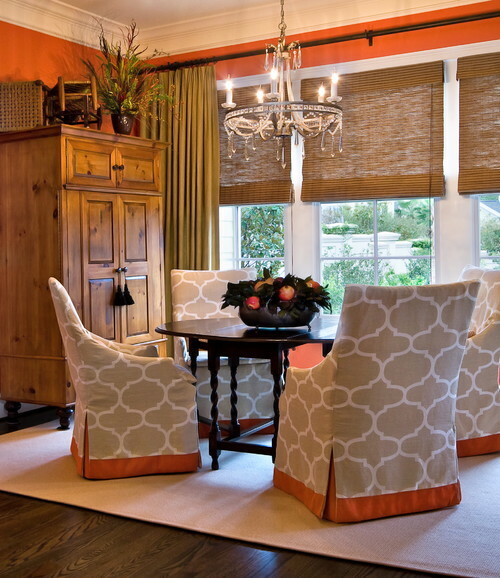 I like the look of the slip-covered chairs, especially the print fabric with the band of solid color at the bottom. And I’m with you. I love the look of upholstery rather than slip covers, especially the chair with the padded, curved back. Regarding the comment about cleaning upholstery, would you consider making a separate seat cushion that has a removable cover for cleaning? I can tell you from considerable experience with kids, dogs, cats, and husbands that the grimiest and most vulnerable part of an upholstered dining chair is the seat. I don’t think I’ve ever had a cleaning issue with the rest of the chair. From the photos we’ve seen so far, there doesn’t seem to be a lot of extra space in your dining room. (I have a narrow dining room so am sensitive to this.) With the host chairs in place, will the furniture be smushed up too close to the fireplace, especially when you have leaves in the table to accommodate guests? The cane back chairs are not wide or heavy but their height makes them take up a lot of visual space. If you have upholstered host chairs at the head and foot of the table their backs will need to be at least as high as the side chairs to keep from looking unbalanced, thus taking up even more visual space as well as their greater physical space. With the table oriented as you are showing it now, which may be the best or only way to do it, having a larger, taller chair will completely obscure the fireplace, making the fireplace rather pointless (in addition to taking up precious inches). You have the two dining chairs with arms that you can reupholster in a fabulous fabric and keep in the entry way flanking the buffet but bring into the dining room when you have guests and need the extra seating. As I mentioned above, my dining room in my funky 1930’s bungalow is very narrow. After years of frustration, I have decided to replace my current dining table (which pre-dates my ownership of the house), that I either have to keep pushed over to one side of the room or to squeeze past, with a custom-made long narrow one and lower backed chairs. I have done a mock up with a cardboard table and chairs I bought on CL. The upholstered host chairs need to go as they are just too solid and weighty for the room even though they aren’t very big. For me, the lesson has been to accept the things in my house I cannot change even if it doesn’t match what Pinterest, blogs, and magazines have made me crave. Why not start with two of the 8 matching chairs and built those out a little? Then you’ll have the same basic shape for all 8, but the end ones will be a little more fancy with arms, upholstery, etc. Kristi, your headline today is… Would you ever consider building your own chairs… My response would be ‘NO’. We are very much DIYers but some things, to my way of thinking, warrant a purchase. I would watch Overstock, etc for a pair of chairs you could customize. We have upholstered chairs to the floor & while I love the look, they are not the most practical. As others have commented, they are hard to pull out, they attract dust along the bottom & they are bulky. All that being said, they do make a statement. Regarding your overall dilemma with the dining room, my honest opinion is the table & chairs are just not working for you. Great price but more of a make do purchase than a WOW purchase. I know dining room furniture is expensive but perhaps there’s a better deal out there for you. I enjoy your blog, your ideas can be inspiring but I’m not feeling this room. I just don’t “get” Kristi’s vision. The wall mouldings are SO elegant / semi-formal and the fireplace tile adds “bling” which has more of a contemporary feel. While I realize she is a professional, I’m seeing her trying to “do too much” in this room. I guess I’m just an adherent to the “less is sometimes more” school. Of course, in the end, it is HER home. If you like this idea as much as I do, then here are two places to buy the cane so you can build your own chairs still. 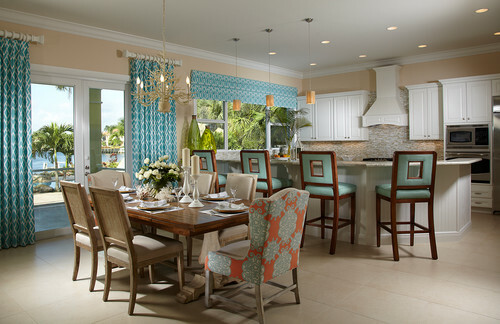 I like this one: ” Beach Style Dining Room by Irvine Interior Designers & Decorators Blackband Design”. The only thing I would change is to make the “arms” lower. I’m concerned that the way they are now, they won’t fit under the table because of the skirt on the table. I would (IF, I had an ounce of talent LOL) make the back of the chair your accent color (coral, I think) and the other portion a bright white. And because of the problems that you might encounter with staining, I’d choose leather… and I’m sure that sounds weird, it’s just that I have a large family consisting of 5 grand-babies under 5, so whenever I look at any type of chair, I always think “will milk.juice/creamed corn, etc” come out of this fabric without a ton of work. LOL. Anyway, anything you do will be fantastic, I’m sure. I am looking forward to seeing your creations! Saw this chair on One King’s Lane clearance section. It reminds me of the ones you like and might be something you could work with. I love that chair! I think it’s exactly what she is thinking in her head. Minus the skirting. Would you consider selling two of the blue chairs? I’m interested. After reading your blog and the comments, may I suggest that you look for a different fabric for your curtains–white and coral stripe with wide white and narrow coral stripes? You can use the watercolor fabric for the leading edge and reverse it on the end chairs, using the stripe for the bottom edging. Also, I encourage you to use casters for the end chairs, even something like an office chair since it will not show underneath the skirt. Another thought–how would the table look set diagonally in the room? Put one end (and end chair) in the corner between the front windows and the fireplace. Who says dining tables must be squared up in the room? I failed to specify vertical stripes on the drapes. That will heighten the look of the walls and not ’embrace’ the room. As soon as I posted my comments, I started looking at fabrics on-line. Haven’t yet found what I originally envisioned, but several ‘sort of’ striped fabrics with more coral than white are looking interesting. I usually end up with fabric different than my original vision, but at least I have a direction to begin. IMHO, I really think your wingback chairs are more suited to your music room. I can envision you having one on each side by the built in shelves in that room. Whilst I love the chairs in your photos, I think it’s adding too many elements in the room. I really think having the 2 arm chairs from the cane set of chairs would look better at the host ends of your dining table, when you need to use them. When not in use, have them flanking either side of the buffet, as they would look gorgeous there. Can’t wait to see the reveal of the chairs painted black. I know they are going to look stunning! I still look at the existing cane end chairs and wonder if you just use those for your upholstered frame. They’re a fairly simple design with few curves (except for the outward bow of the arms). All you’d really have to do is cut the arms off and attach a curved board to make the wing and new sloped arm, maybe add a panel to the back for extra strength against the cane, and then wrap the whole thing in padding and whatnot and complete the upholstery. You might have to pad the wing out from the chair slightly with some 1-by lumber to leave enough room for the stuffing and have the chair still be wide enough to sit in. The benefit is that they’d be the same scale and width as the other chairs, so they’re guaranteed to fit and look right. They’d also be around the same weight, provided you don’t add too much heavy framing. One tip on the weight issue… We have hardwoods throughout the house and I swear by stick-on felt pads. Every piece of furniture that comes into our house, I turn it over, remove the nylon feet with a pair of pliers, and replace them with felt. They slide around on hardwood with no problem and don’t scratch the finish unless you have a lot of sand or grit on the floor. I just moved a fully loaded china cabinet across the room by myself by inching it gently along on the felt pads (I was being lazy). Since you’re doing a rug and full skirts on the end chairs, you might want to consider just putting the end-chairs on wheels. You could chop an inch or two off the legs to keep them the pre-wheel height. You’ve totally got this! I know your chairs will be awesome! I’ve built chairs before and once you get past being intimidated by the thought of building chairs, it’s just following the steps in the plan. I can’t wait to see what you create! I like the cane wing back chairs. They work. Much lighter all around. If you are stuck on making your own maybe Anna White’s blog will have something for you. Personally, I’d start looking for the cane wing backs. The fully opholstered chairs might be overwhelming to your cane side chairs. I can understand your frustrations as most of my projects end up doubting my decisions. I wonder what white chairs with your fabric of choice would do for the room. I agree with Lynne was just going to post white chairs myself! Hmmm, would something like this work for you? I get some of my best inspiration, decorating and otherwise, at church. Take a break and enjoy this Easter weekend with your family. Attend church and get inspired! Hi Kristi, just FYI, the first link for comments from your last post that you’re still mulling over, doesn’t work. It links to Ana White, not your own blog! Bravo to you for trying to build your own chair! Just wondering if the one pictured above without the high and might be easier for your husband to get in and out of. I would think that anything with arms higher on the side would make it more difficult for him?